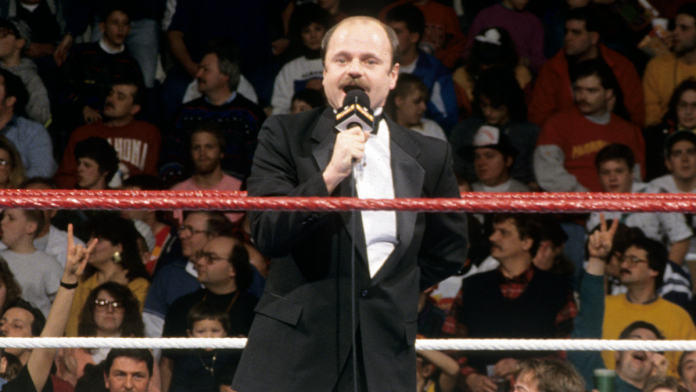 Legendary WWE ring announcer Howard Finkel is in New York City for WrestleMania 35 and he looks a lot different. Bruce Prichard and Zack Ryder caught up with the WWE Hall of Famer today at the hotel WWE talent and employees are staying at. They posted photos of Finkel on Twitter and as you can see below, he now has a gray beard and is, unfortunately, wheelchair-bound. Finkel in a wheelchair would explain why he stopped making public appearances last year. Jerry “The King” Lawler said last July on his podcast — Dinner With The King — that 68-year-old Finkel is dealing with serious health issues and may have suffered a stroke. Finkel began working for Vince McMahon’s father, Vincent J. McMahon, in 1975, and moved to ring announcing duties the following year, eventually becoming the benchmark against which all others would be judged, with his deep, booming delivery tailor-made for the role. Finkel’s on-air role began to decrease during the Attitude Era, but his unbroken 43-year tenure makes him WWE’s longest-serving employee. Up until 2016, he appeared at every WrestleMania. Finkel sent out his last tweet in April when he commented on the passing of WWE Hall of Famer Bruno Sammartino.